POSTED November 30, 2017 11:25 a.m. 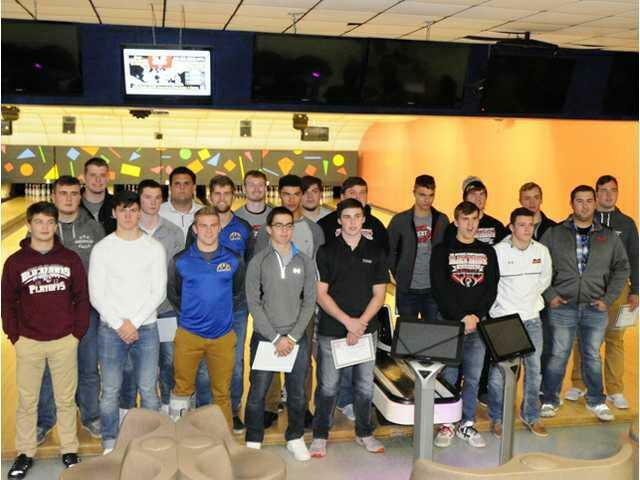 The Southwest Wisconsin Shrine Club and Queen B Radio announced its 2017 All-Area football team at an awards ceremony at Pioneer Lanes in Platteville on Sunday, Nov. 19, where 10 area players were honored. Platteville’s Ryley Bailey was named the All-Area Coach of the Year, while Lancaster senior Evan Gates shared the Offensive Player of the Year award with Platteville senior Donovan Blevins. Black Hawk senior Brody Milz was named the Defensive Player of the Year, while Platteville senior Ian Carter was named the Lineman of the Year. Bailey led the Hillmen to a 9–2 record and a share of the Southwest Wisconsin Conference championship and in the process his offense shattered a number of school passing and receiving records and was named the SWC Coach of the Year. Gates was named this year’s Southwest Wisconsin Conference Offensive Player of the Year after rushing for 2,051 yards and 33 touchdowns on 296 carries, and was a First-Team All-State selection by the Wisconsin Football Coaches Association. Blevins was one of five wide receivers named to the All-State first team. He caught 65 passes and finished second in the state with 1,315 yards and 21 touchdowns. Blevins also earned All-Area honors as a defensive back and a return specialist. Carter was named the SWC Offensive Lineman of the Year. Milz was named this year’s Six Rivers Offensive and Defensive Player of the Year and recently received WFCA All-State honors as both a running back and a linebacker. Milz finished the year with 163 tackles, including 16 tackles for loss, 6.5 sacks and three interceptions, and also rushed for 1,685 yards and 28 touchdowns. Lancaster senior Evan Straka earned a spot on the All-Area team as one of two quarterbacks, while Potosi/Cassville senior Dylan Pluemer was among seven running backs selected. Lancaster senior center John Wagner and Potosi/Cassville seniors Brandon Kinyon and Ben Wheeler were among the 11 offensive linemen to receive honors. On the defensive side, Lancaster had four players receive All-Area honors, and included: senior linemen Dalton Gardner and Gabe Hudson, along with junior linebacker Troy Klein and senior defensive back Garett Birkett. Brody Milz, Black Hawk, sr.
QB – Ethan Bernhardt, Platteville, sr.
QB – Evan Straka, Lancaster, sr.
RB – Evan Gates, Lancaster, sr.
RB – Tyler Smock, Prairie du Chien, jr.
RB – Brody Milz, Black Hawk, sr.
RB – Dylan Pluemer, Potosi/Cassville, sr.
RB – Brady Peat, Iowa–Grant. sr.
RB – Riley Workman, Mineral Point, sr.
RB – Kordel Stillmunkes, Cuba City, sr.
WR – Donovan Blevins, Platteville, sr.
WR – Zach White, Platteville, sr.
WR – Jett Rufenbacht, Black Hawk, sr.
WR – Trevor Neuroth, Fennimore, sr.
OL – Ian Carter, Platteville, sr.
OL – John Wagner, Lancaster, sr.
OL – Billy Schlueter, River Valley, sr.
OL – Mitchell Quinn, Black Hawk, jr.
OL – Brandon Kinyon, Potosi/Cassville, sr.
OL – Nathan Hull, Black Hawk, sr.
OL – Ben Wheeler	, Potosi/Cassville, sr.
OL – Josh Lehman, Pec/Argyle, sr.
OL – Grant Sporle, Mineral Point, sr.
OL – Clint Havlik, Iowa–Grant, sr.
OL – Nick Schaal, Cuba CIty, sr.
OL – Joey Dolphin, Mineral Point, sr.
DL – Dalton Gardner, Lancaster, sr.
DL – Billy Schlueter, River Valley, sr.
DL – Ian Carter, Platteville, sr.
DL – Gabe Hudson, Lancaster, sr.
DL – Cam Brant, Platteville, sr.
DL – Jett Rufenacht, Black Hawk, sr.
DL – Josh Lehman, Pec/Argyle, sr.
DL – Logan Murphy, Cuba City, jr.
DL – Joey Dolphin, Mineral Point, sr.
LB – Troy Klein, Lancaster, sr.
LB – Zach White, Platteville, sr.
LB – Shane Liegel, River Valley, jr.
LB – Jason Treuthardt, Black Hawk, sr.
LB – Brody Milz, Black Hawk, sr.
LB – Paul Burrows, Cuba City, sr.
LB – Brady Peat, Iowa–Grant, sr.
DB – Donovan Blevins, Platteville, sr.
DB – Garrett Birkett, Lancaster, sr.
DB – Brett Nachreiner, River Valley, sr.
DB – Michael Flanagan, Black Hawk, sr.
DB – Brooks Tiedeman, Benton/Scales Mound, jr.
DB – Ryan Hoppenjan, Cuba City, sr.
DL – Josh Lehman	, Pec/Argyle, sr.
LB – Shane Liegel	, River Valley, jr.
DB – Brett Nachreiner	, River Valley, sr.
DB – Brooks Tiedeman	, Benton/SM, jr.
DB – Liam Kenney, Fennimore, sr.
K – Zach White,	Platteville, sr.
P – Nate James	, Dodgeville, sr.
RS – Donovan Blevins, Platteville, sr.
AP – Gavin Gillitzer, Prairie du Chien, sr.